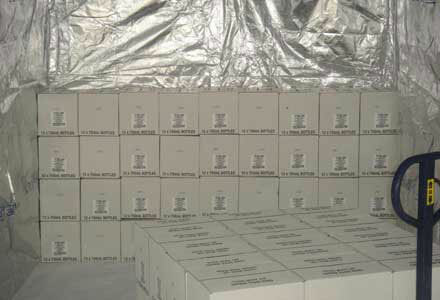 Supplier produk Cargo Protection, Logistics Material Handling and Industrial Packaging. PT JMP Indonesia, Supplier produk Cargo Protection, Logistics Material Handling and Industrial Packaging. Customer kami antara lain : Dai Nippon Printing, Toray Synthetic, Metec / Kubota, Cargill, Yasulor / L’oreal, Air Asia, Albea Techpack, etc. Price = USD 225 per pcs. The original and still the number one Thermal Container Liner in the world! Over a decade has passed since the launch of a product which has redefined the transportation of wine and other goods sensitive to temperature fluctuations. The patented Envirotuff Thermal Container Liner (ETL) is an innovation that swept across the globe replacing outdated insulation products due to its supreme efficiency and effectiveness. JMP Holdings Pty Ltd has lead the way by first introducing the Envirotuff Thermal Liner into the Australian market and then following it up with worldwide distribution. 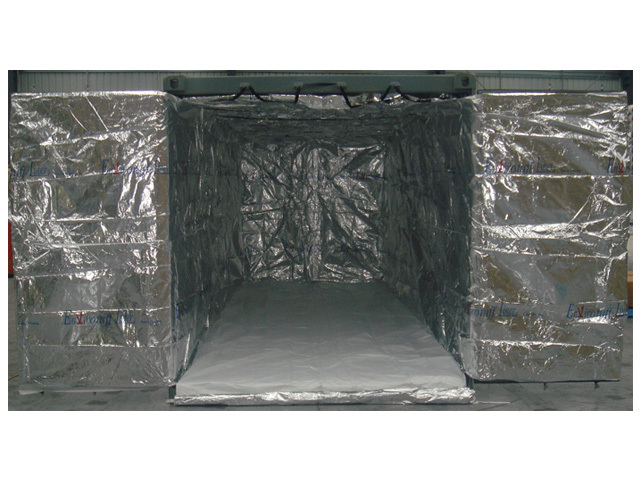 The Envirotuff Thermal Liner has been designed to insulate standard dry ocean freight containers by creating a special radiant barrier, enabling the goods within to be protected from the dangerous temperature spikes witnessed during transportation. 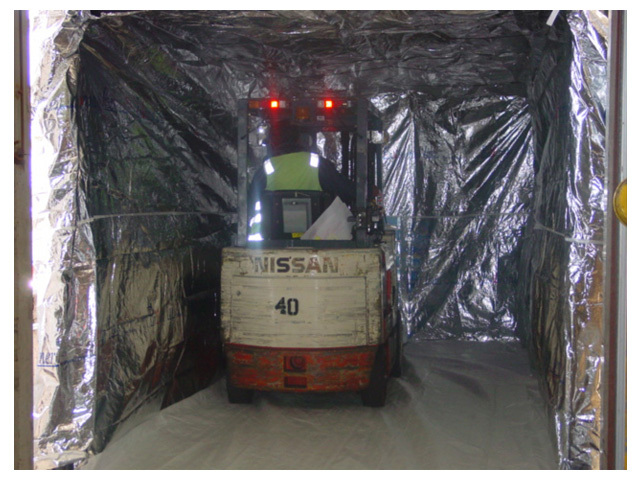 Why do shippers insulate containers and pallets? Across all industries, moving products in shipping containers can expose the goods to severe temperature fluctuations. In many cases this can cause irreversible damage to the product resulting in lost sales, expensive insurance claims and most importantly a loss of customers faith in your product. A prime example of where temperature variations can cause havoc is during the transportation of wine. Even minimal fluctuations can result in problems such as loss of bouquet, product oxidation and even leakage through cork dryness. The art of winemaking is a very exact science and also an extremely competitive business. It is essential that the wine is crafted, aged and then stored to the winemakers exact specifications. 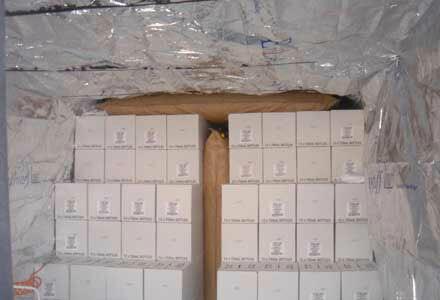 However when it comes to transporting this wine the whole process can be undone if proper protection such as the Envirotuff Thermal Liner is not implemented. Is it worth risking your whole shipment? 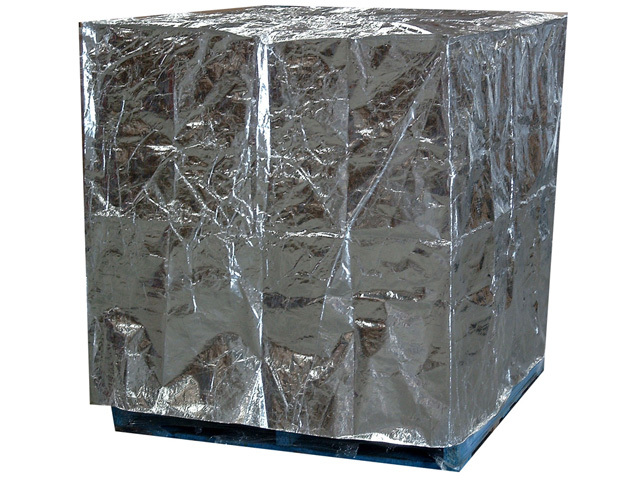 Compared to the value of a 20′ or 40′ container full of wine, electronics, food etc., the Envirotuff Thermal Liner represents only a tiny fraction of the total cost of goods, insurance and shipping. It really is a small price to pay for peace of mind. How does the Envirotuff Thermal Liner work? 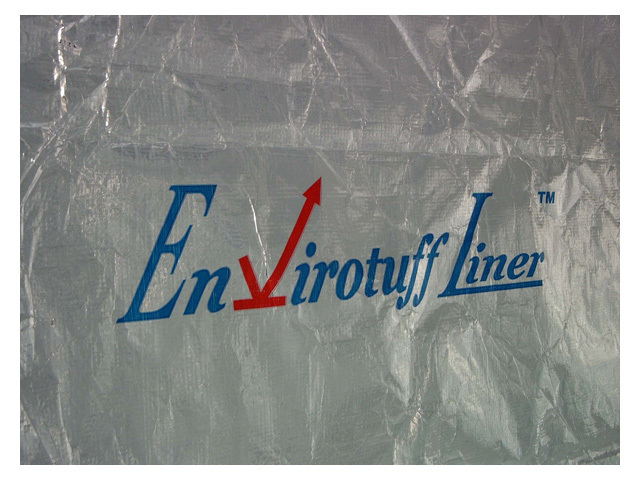 The Envirotuff Liner is a fully woven reflective liner that is hung into a general-purpose ISO shipping container and allows for forklift loading, hand loading and slip sheet. 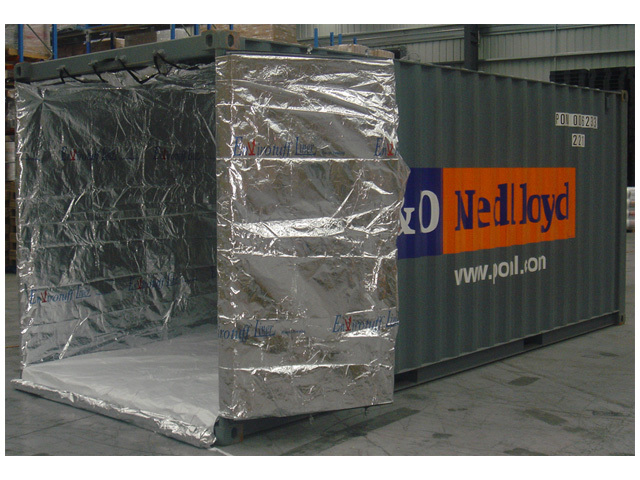 Once loaded it is fully sealed protecting all six walls and providing a closed off temperature and humidity controlled environment for the goods within. 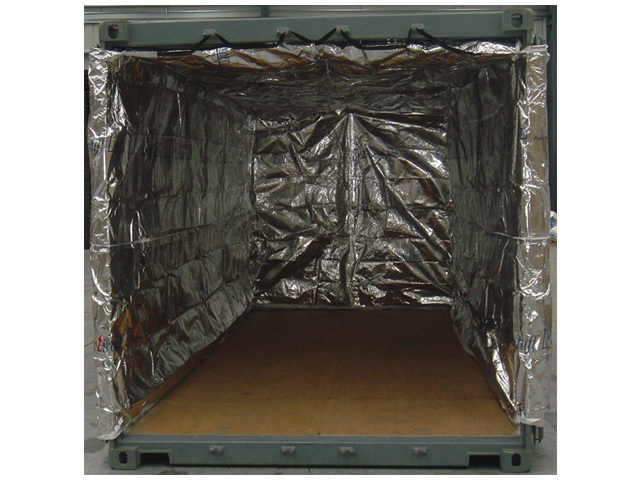 Without the proper protection of the ETL, cargo inside a container can be exposed to dangerous heat penetrating in three ways, conduction, radiation and convection. Conduction occurs when the cargo makes direct contact with the container walls. 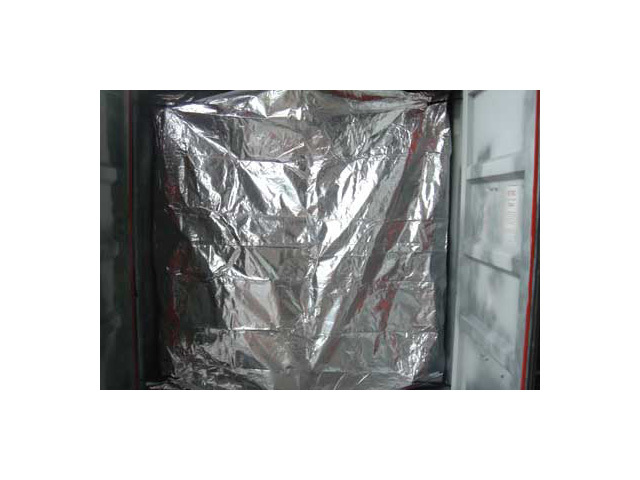 Radiation or radiant heat penetrates through the container wall from the outside via infrared radiation whilst convection is the hot air circulating throughout the container. 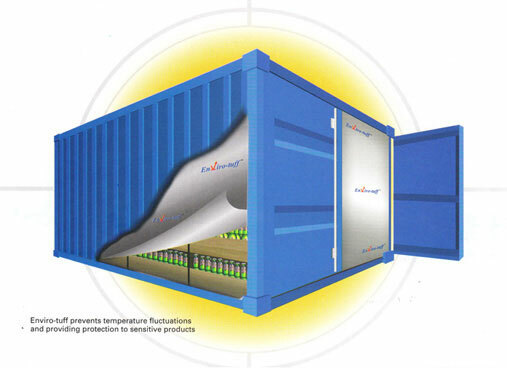 The ETL eradicates these problems by reflecting up to 96% of the radiant heat, preventing the cargo from making direct contact with the container walls and preventing hot or cold air coming through the fully sealed liner. The Department of Mechanical & Materials Engineering at the University of Western Australia conducted tests which showed the ETL has an emittance rate of 4% with the nearest insulation alternative only scoring around 50%. In simpler terms those using these inferior insulation alternatives are only offering their goods half the protection that the ETL offers. Because the environment within the liner is less exposed to the fluctuations outside there is less chance the temperature inside will drop below the dew point, which can cause condensation and subsequent moisture damage. 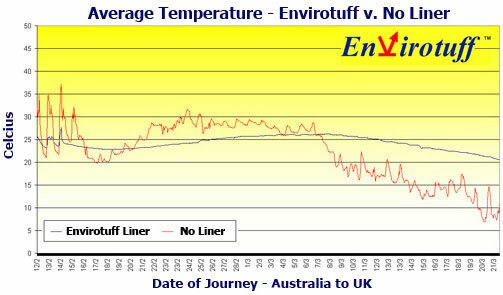 Why is Envirotuff the number one thermal liner? Half the answer to that is actually contained in the question. 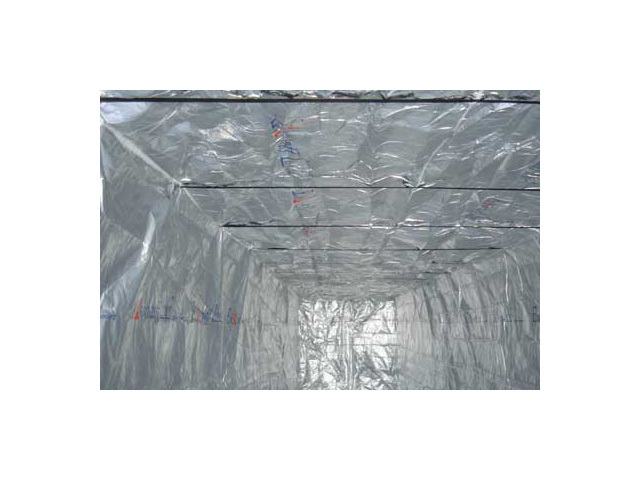 Because it is a ‘liner’, providing protection inside a fully enclosed environment. Nearly all other insulation alternatives are NOT built as liners but rather come in multiple sections that do not connect together. This is a cost cutting technique which greatly reduces the protection offered to the goods. As a result, without a sealed environment you risk exposing your product to large amounts of hot (or cold) air flow during transportation and you may therefore experience damaging temperature fluctuations. The second half of the answer is the ETL is produced from a highly reflective material but has also been designed with a specially patented hanging system which provides a thermal buffer zone between the outer side of the liner and the inside of the container wall. This offers great protection to the goods close to the container wall. Other insulation alternatives which come in sections have to be stuck firmly to the container wall. This creates two problems with the first being whole sections of insulation falling down during transportation. The second problem is without the buffer the insulation stuck to the wall actually transfers considerable temperature directly onto the nearby product which can cause severe damage. What are the advantages of using the Envirotuff thermal liner? The ETL simply offers more than other alternatives. It is more cost effective and better performing than bubble wrap and thermal blankets and is much cheaper, stronger and easier to install than other types of liners. The ETL does not require the use of double sided adhesive tapes, glues, mechanical blowers & devices during installation inside an ISO container. You merely hang the ETL using the lashings provided and tie it to the lugs inside the container. This task can be done quickly by one operator. 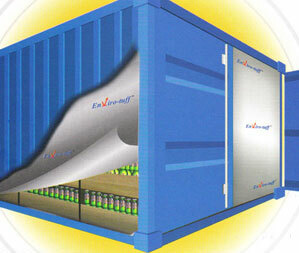 The ETL is specifically designed for usage in general purpose ISO shipping containers both 20′ and 40′. 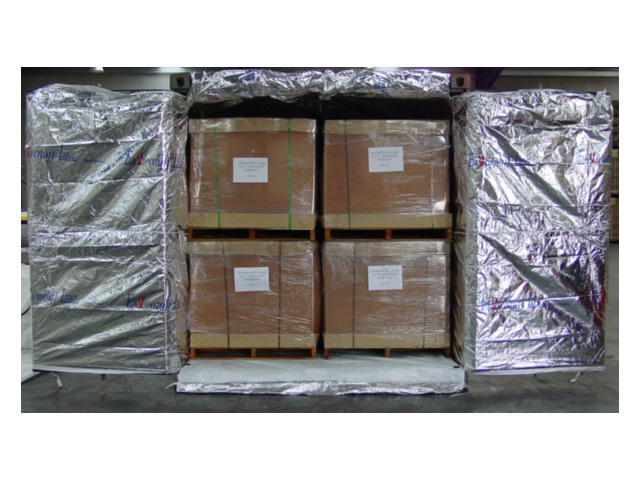 However, because of the versatility and ability of the Envirotuff material we have also designed thermal protection products such as pallet covers and airfreight liners. As you can see from below we have a full range of Envirotuff Liners including pallet covers and airfreight covers. Who uses Envirotuff Thermal Insulation? 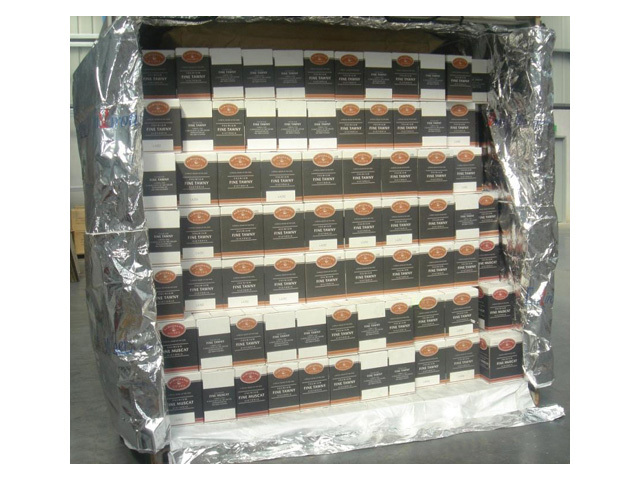 The Envirotuff Liner whilst ideal for the wine industry is also ideal for hundreds of other applications. Due to its affordability, ease of installation, versatility and strength it can be used across many industries including food and beverage, automotive, plastics, chemicals, computing and electronics.